Need Samsung WF448AAP Steam Front Load Washer Reviews & Ratings? This front loading steam washer is Samsung's flagship model. With a whopping 4.5 cubic feet of capacity, Samsung claims it can wash 28 bath towels in one cycle. While we cant verify this, we can verify that 4.5 cu. ft. is among the larger washers we've reviewed. The size can definitely make things easier if you have a large family, but will probably make less sense if your just a party of two. Along with the extra large capacity, our review uncovered all the bells and whistles including Energy Star Compliance, SliverCare clean system, Vibration Reduction Technology (VRT) and an easy to use control system. The WF448AAP offers a lot of value and holds it own with models costing significantly more. Keep in mind that the pedestal isn't included and a matching one will cost you around $200. Cycle time is 90 minutes, by no means short, but your clothes will come out clean. #1) Huge Capacity: The Samsung WF448AAP should allow you to cut down on your washing duties. Smart technology will also account for smaller load sizes by adjusting water levels and cycle times. #2) Sleek Styling: Looks great, ideal for buyers looking for both style and function. Samsung has always paid a lot of attention to their washers look & feel and this model is no different. #3) Low Noise: This washer is especially quiet due to Samaung's Vibration Reduction Technology (VRT) which figures out how to balance the load during high spin cycles and compensates to reduce noise & vibration. This washer also has direct drive motor which eliminates need for loud belts and gears. 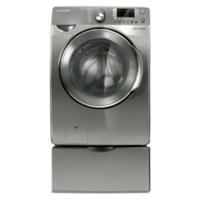 #4) High speed spin cycles: This reduces drying times after wash especially large items like comforters. Spin speeds up to a screaming fast 1,300 RPM's really help wring out additional moisture from clothes. #5) Extra Sanitization: SilverCare system uses Silver Ions to clean clothes during cold wash. Great when for washing dark colored clothing to help retain colors of lifetime and sanitize as well as hot washes. #6) Easy to use display: Samsung's eperience in creating very functional user interfaces help make the learning curve a lot easier. Expect to get up and running within a few minutes of product installation. #7) Steam technology: The deep cleansing power of steam washing, helps reduce need to pre-treat stains. #2) Relatively long cyle times: 90 minute Cycle Times are longer than most we've tested. One could argue that larger wash load capacity makes up for this. #3) Small Details: Interior light goes off too quickly when unloading laundry and stainless steel color option scratches easily. Our review highlights the fact that this is one feature packed washer and is priced accordingly. If within budget, feel confident in your purchase.